Operational ceiling height is 10-12 m.
Automatic built-up docks based on 2 docks per 1,000 sq.m. 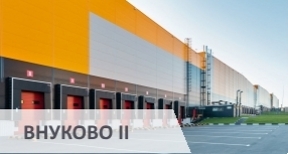 - warehouse complex of 52,436 sq.m., located at the 15 km from the Moscow Ring Road via Novorizhskoe Highway; it consists of five facilities; first three facilities were put into operation in 2008. 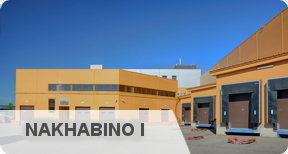 - the warehouse is equipped with a convenient access way for heavy duty vehicles and large ground for manoeuvring. 24/7 guarded parking lot is provided. Constant video surveillance is conducted in order to provide safety and security of cargoes; two gates have a security control point (entrance and exit). 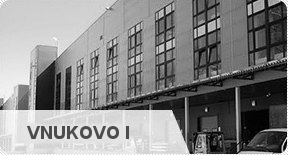 - for the employees’ convenience, autolines run from the underground stations Strogino, Shchukinskaya and Tushinskaya to the complex. 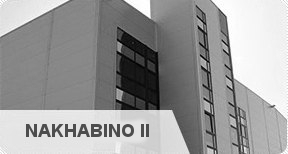 - there is a café in the territory of Nakhabino I warehouse complex, which works from 9 a.m. till 6 p.m. and offers a wide selection of food and beverages, business lunch; additional services of the complex include banking services, terminals for payment of the utility bills and mobile services, as well as a car wash working from 8 a.m. till 11 p.m.
- convenient to rent offices in the second and third facilities of the warehouse complex, as well as in a separate four-storey building — administrative and amenity complex. The tenant is entitled to choose the layout. - an office complex with all things necessary for operation; separate sanitary arrangements and a recreation space at every storey. The first story, a show-room space, will ideally suit for corporate events, banquets, and celebrations. - comfort dining hall, parking for employees’ vehicles.